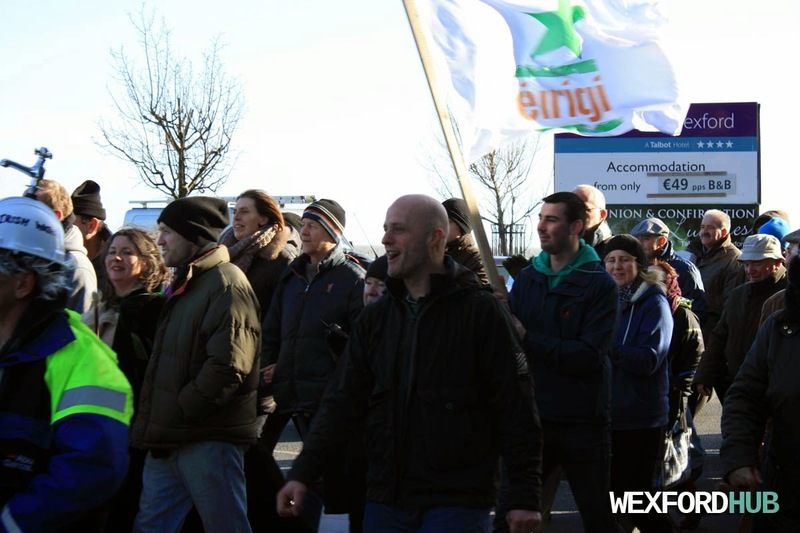 Photographs of the Right2Water protest march in Wexford. These were taken on the morning of the 31st of January, 2015. It was a bitter cold day with gale-force winds. A man waves an eirigi flag. In case you didn't already know, eirigi is a socialist republican political party. Also visible is Deirdre Wadding, who is a People before Profit councillor. 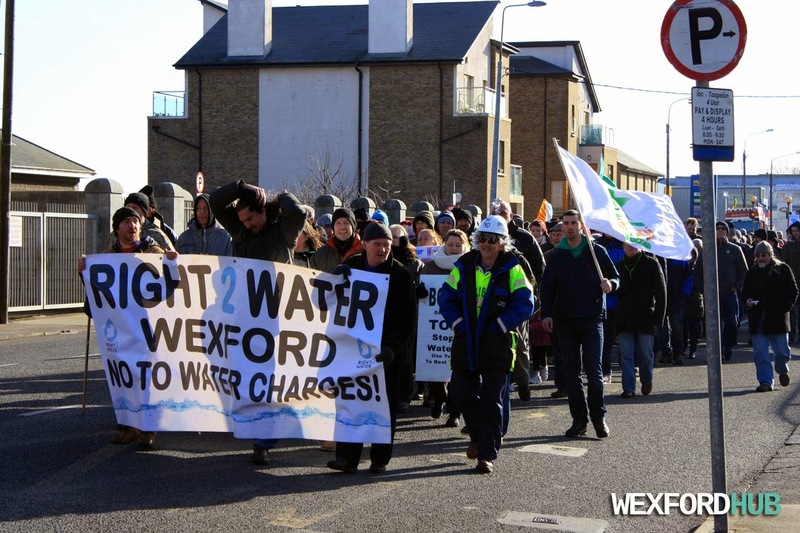 Check out the Irish Water hat on the left! 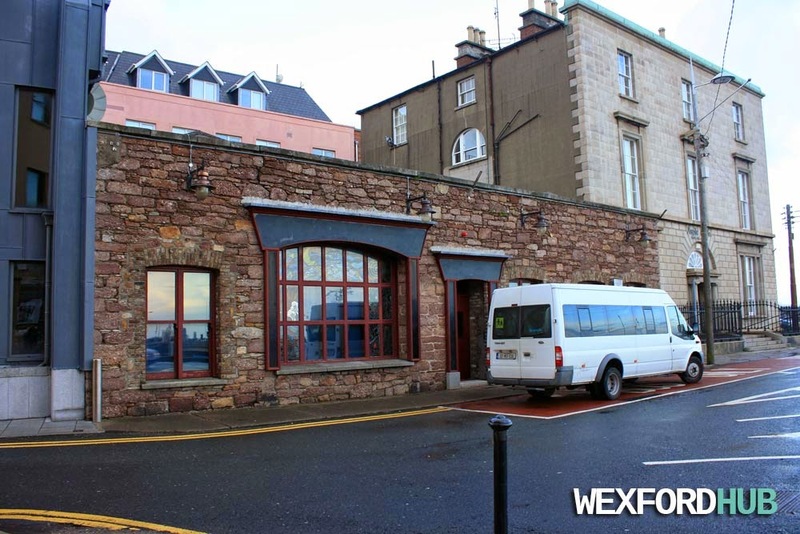 A photograph of the stone building that once contained Asples Bar in Wexford Town. This was a popular night spot for many years until it closed down. The premises was also home to a bar called Jazzy B's, which opened in 2010. The architecture of this building is pretty interesting. While the front is old-fashioned brick-work, the other side is extremely rounded and modern-looking. 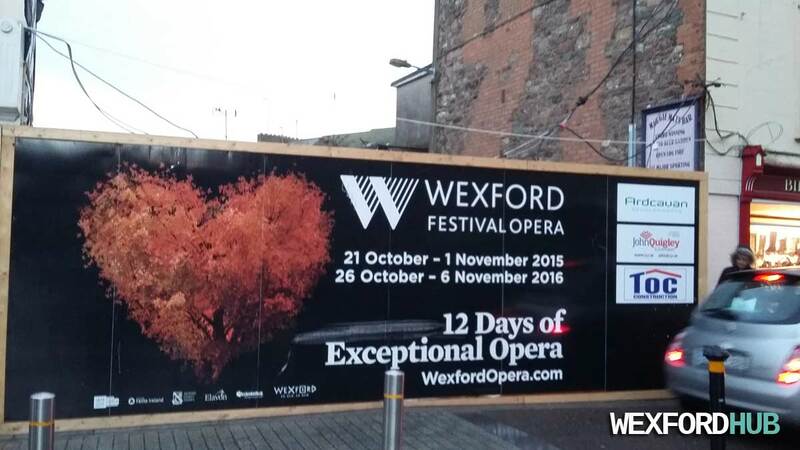 This was taken in the Crescent Quay car park. 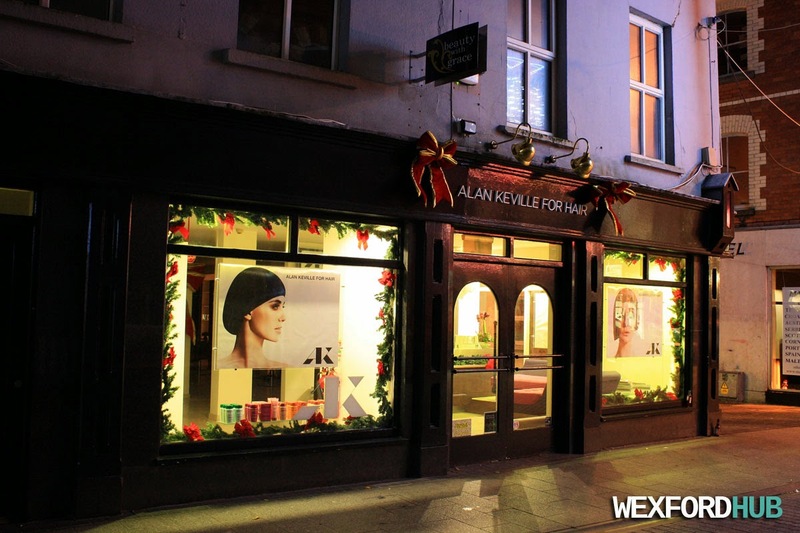 A photograph of the Alan Keville For Hair premises on Wexford's North Main Street. In the past, this building was occupied by Vila, before it moved further up the Main Street. 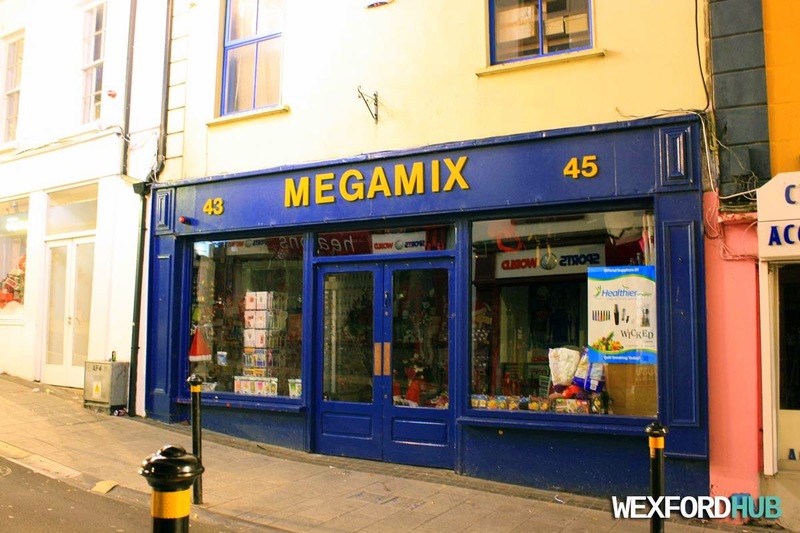 Megamix is a discount store that trades on Wexford's South Main Street (down the road from Simon's Place, beside the premises that used to house the Wool Shop). 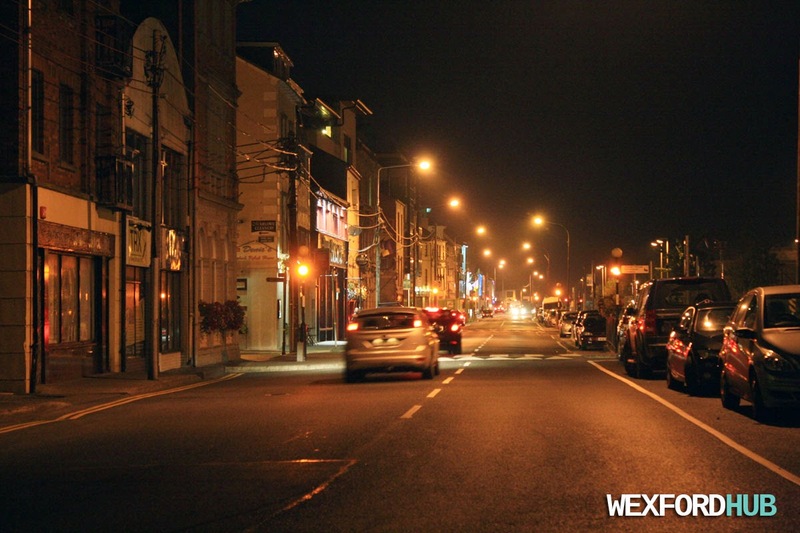 Megamix has been apart of Wexford's Main Street for many years! 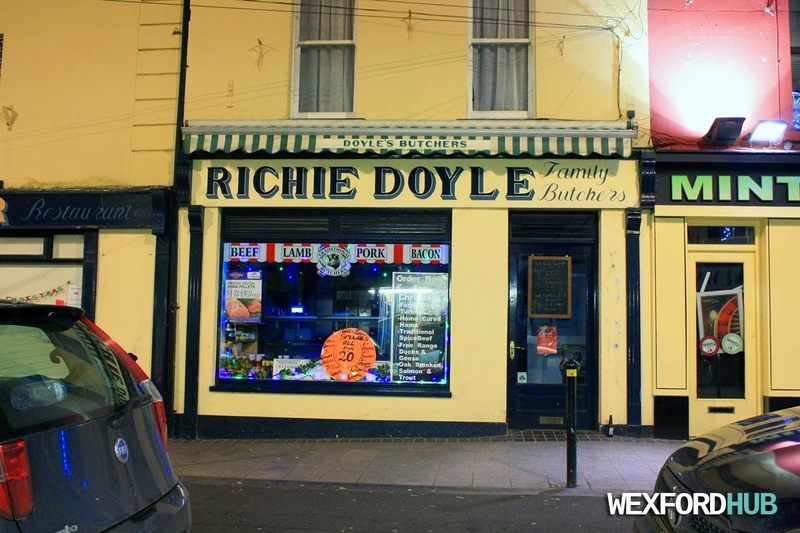 A photograph of the Richie Doyle Family Butchers store on Wexford Town's South Main Street. 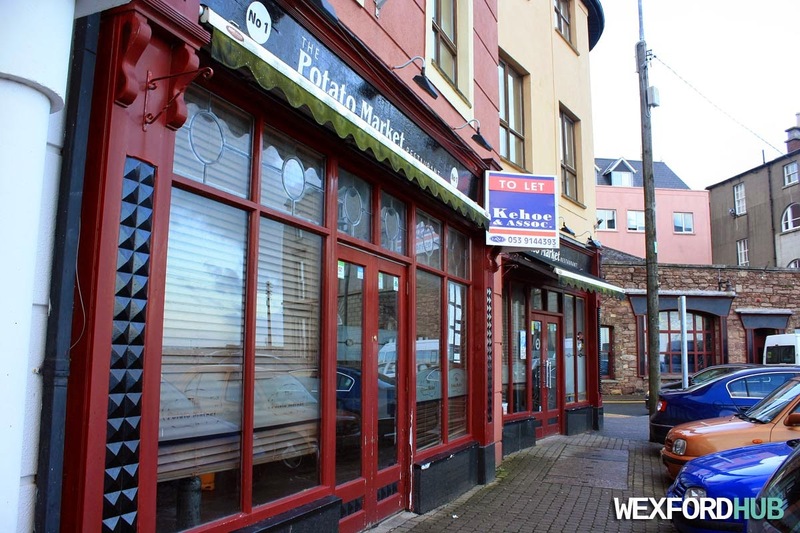 This butchers has had a presence in Wexford's town centre for nearly 30 years. To the right, you can see the Mint Casino. 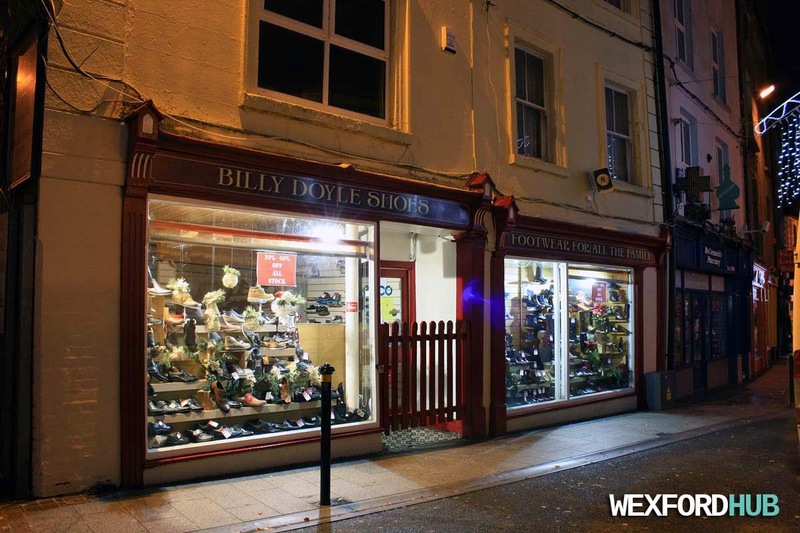 A photograph of the Billy Doyle Shoes premises, which is situated on Selskar Street in Wexford Town. Photo date: 26th Dec 2014. 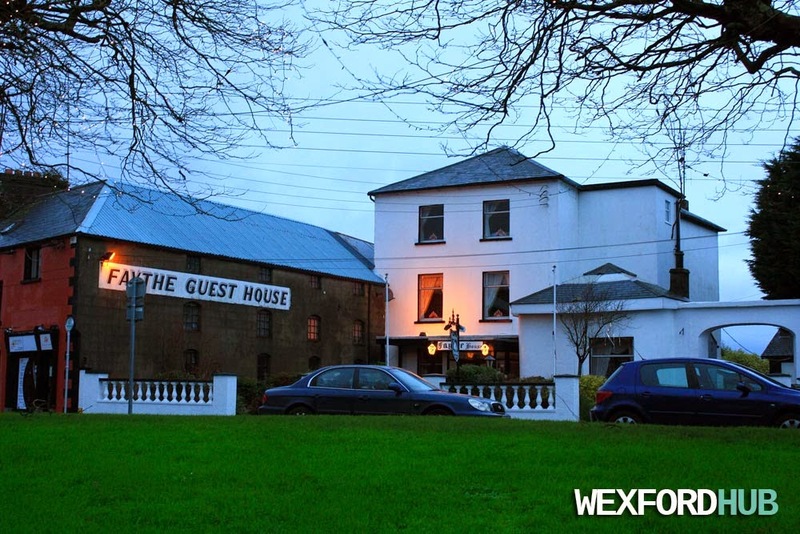 A photograph of the Faythe Guest House, which is a B&B in the Faythe area of Wexford Town. Photo taken on a damp St. Stephen's afternoon in 2014! A photograph of the Potato Market, which was a restaurant that was situated on Wexford's Crescent Quay. 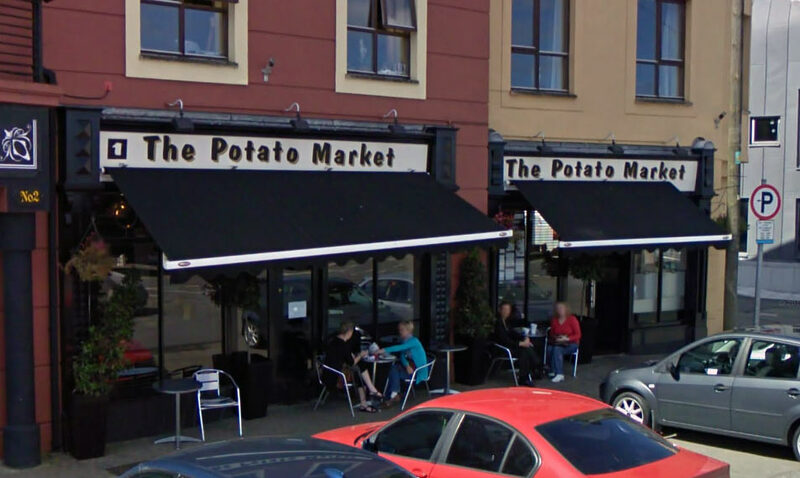 In April of 2014, the restaurant was issued with a closure order by the Food Safety Authority of Ireland. 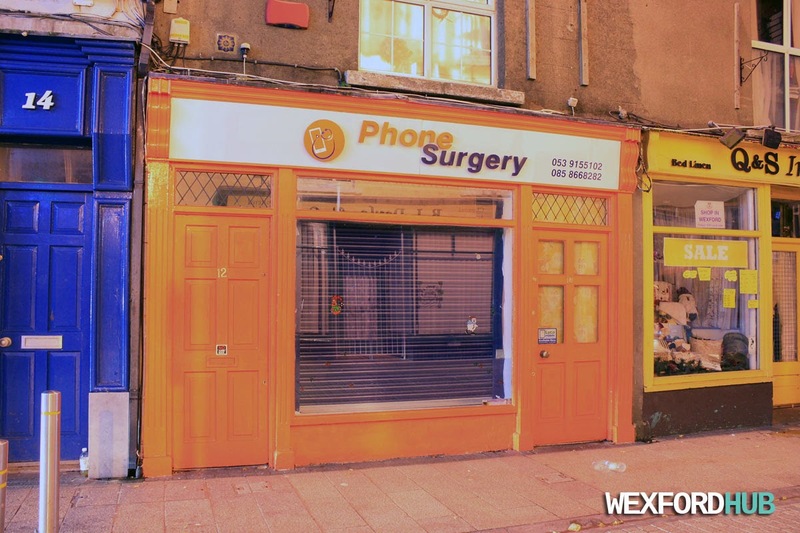 A photograph of Phone Surgery, which is a mobile phone repair shop that is located on Selskar Street in Wexford Town. Phone number: 053 9155102. This shot was taken in December of 2014. A photograph of the Channing House building on Wexford's Rowe Street. 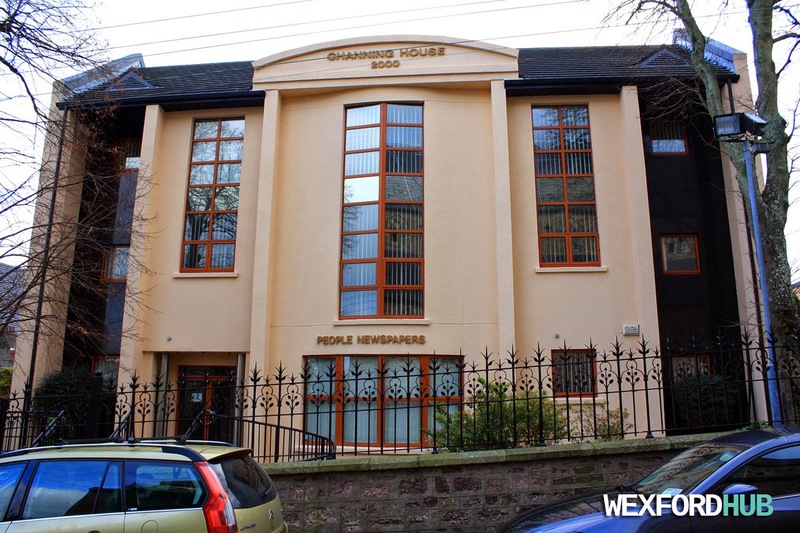 This building is home to the Wexford People newspapers. 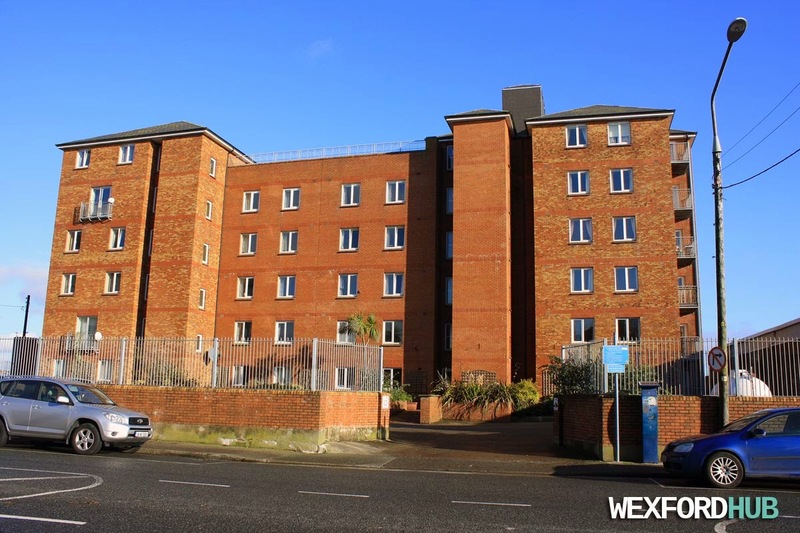 A photograph of the Key West apartments in Wexford Town. 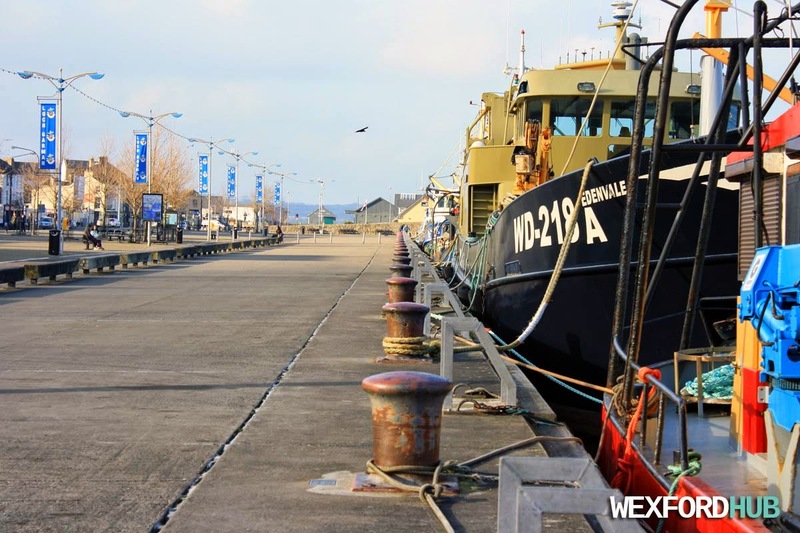 Located on the Custom House Quay. Also visible is the entrance to Pettit's Supervalu. On the right, you can see the South East Radio premises. On the left, you can make out Barrett's Bar. A photograph of an abandoned house that has been blocked up and sealed off. 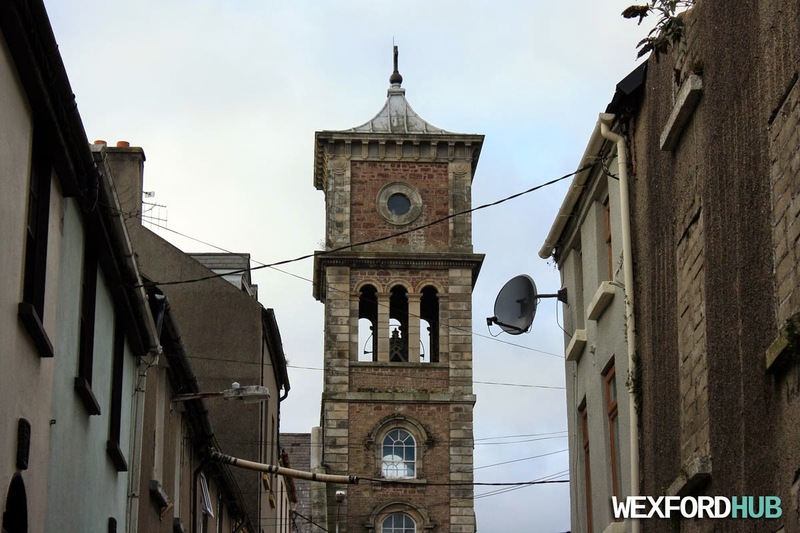 This is located on Mary Street in Wexford Town, Ireland. 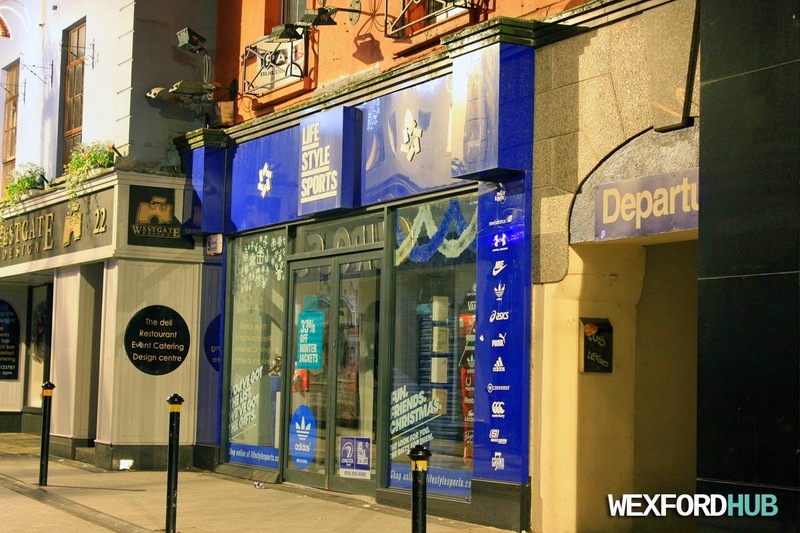 A photograph of the Lifestyle Sports shop on Wexford's North Main Street. As the name suggests, this particular outlet sells sportswear (jerseys, runners and tracksuits, etc). To the right, you can see the entrance to Fettit's Laneway. In the past, this area was home to M&J's! 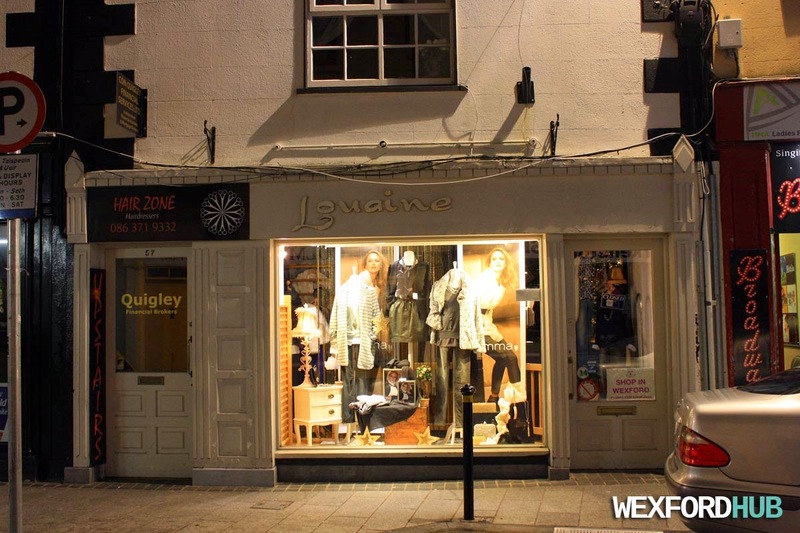 A photograph of Louaine, which is a high-end women's fashion boutique on Wexford's South Main Street. To the left, you can spot the entrance for Hair Zone, which is a hairdressers (obviously). 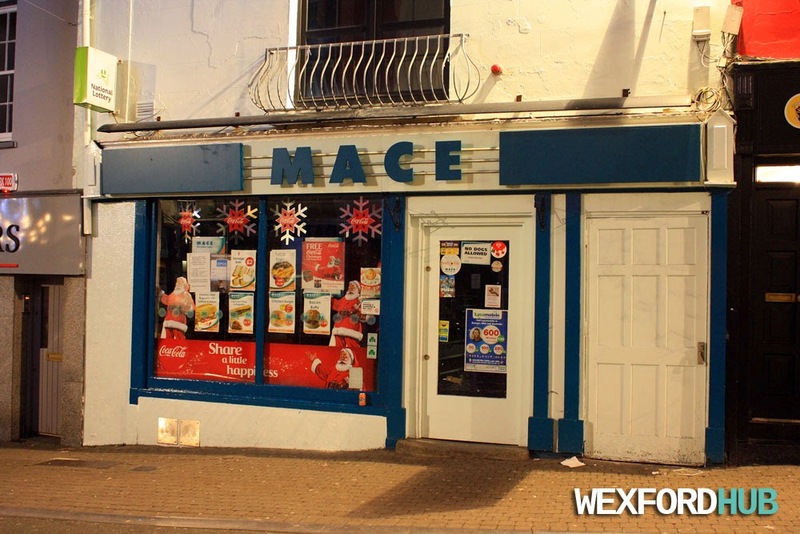 A photograph of the MACE shop on Wexford's North Main Street. 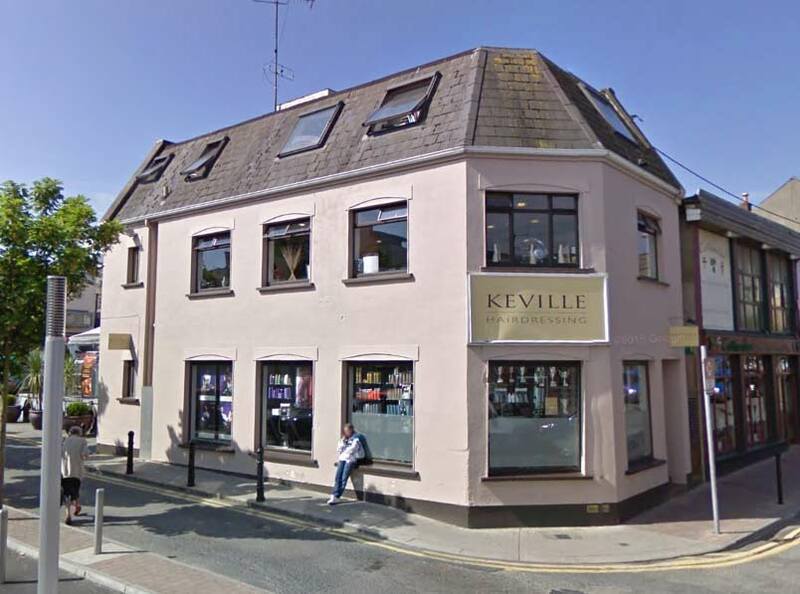 A decade or two ago, this premises was occupied by Tommy Roche's pub. I remember the owner saying that he had found an old keg in the basement! In the more-recent past, it was a Centra shop. 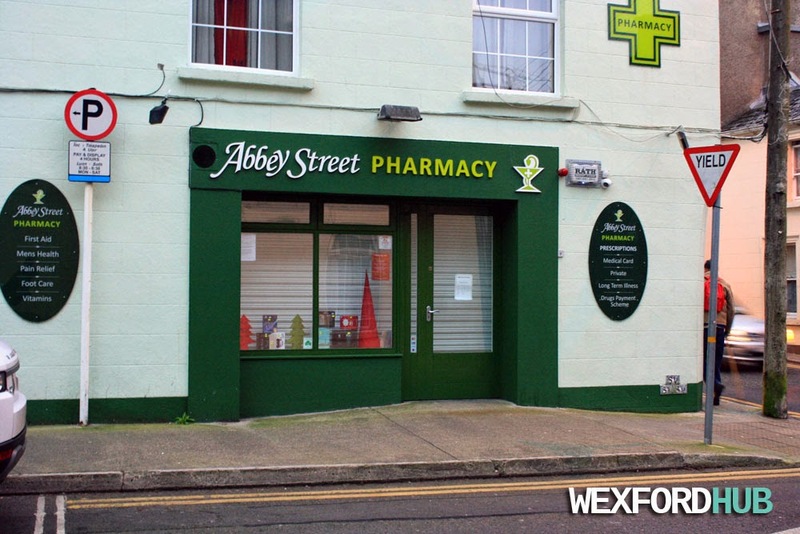 A photograph of the Abbey Street Pharmacy premises in Wexford Town. In the past, this building was occupied by a newsagents called "The Gem". 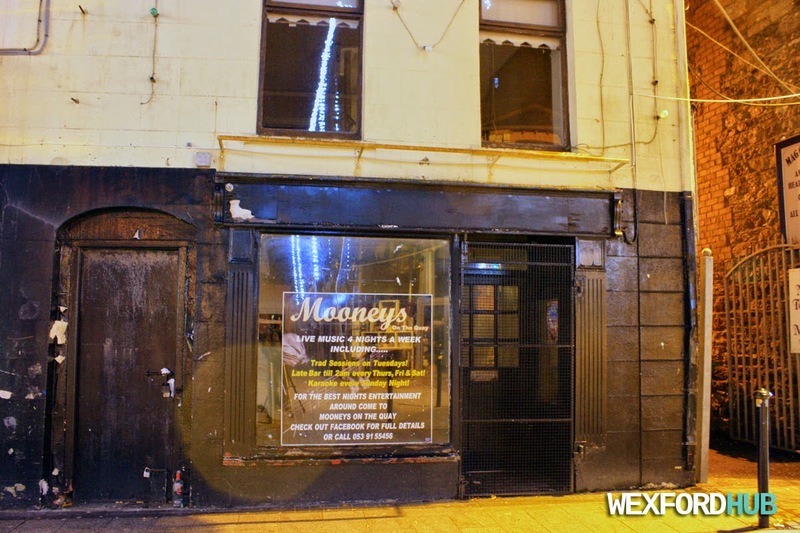 In more recent times, it was home to Moloney's Grocers. This pharmacy is situated on the corner of Abbey Street and George's Street. 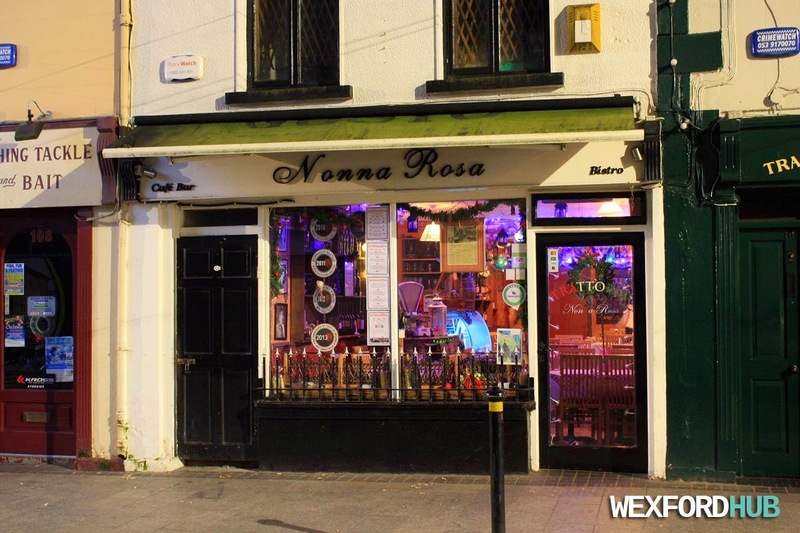 A photograph of the Nonna Rosa premises on Wexford's South Main Street. Nonna Rosa is an Italian Restaurant / Cafe that serves gourmet Italian cuisine. This is one of the most popular restaurants in the town. Update October 2015: It seems as though Nonna Rosa has been replaced by a tapas bar called Donna Marina. 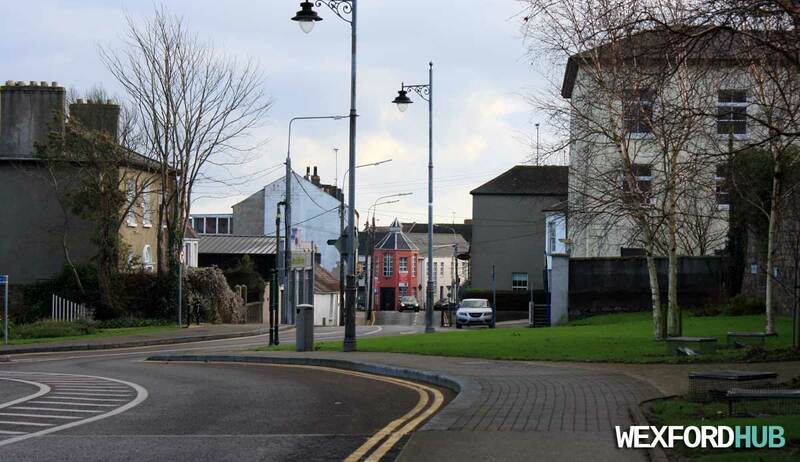 A photograph of Westgate in Wexford Town. Taken on the 29th of December, 2014, at the top of 1798 Street. As you can see, it was an extremely cold and frosty morning (and my fingers were nearly falling off as I tried to hold the camera). 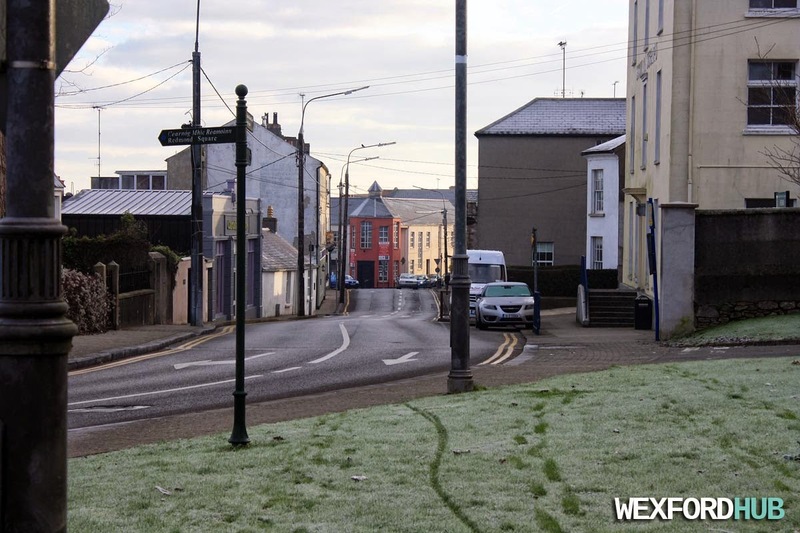 To the right, you can see the main entrance to the Wexford Vocational College (aka The Tech - recently renamed as Selskar College). 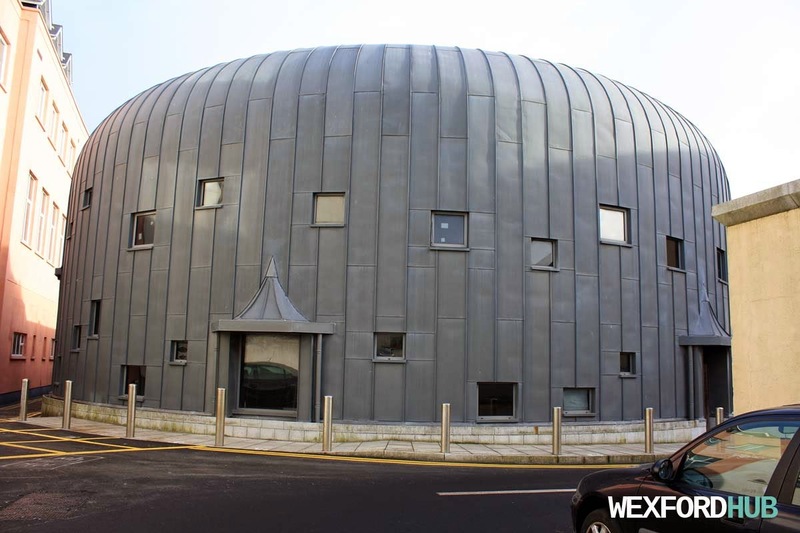 A photograph of Psychosis, which is situated on Mallin Street in Wexford Town. 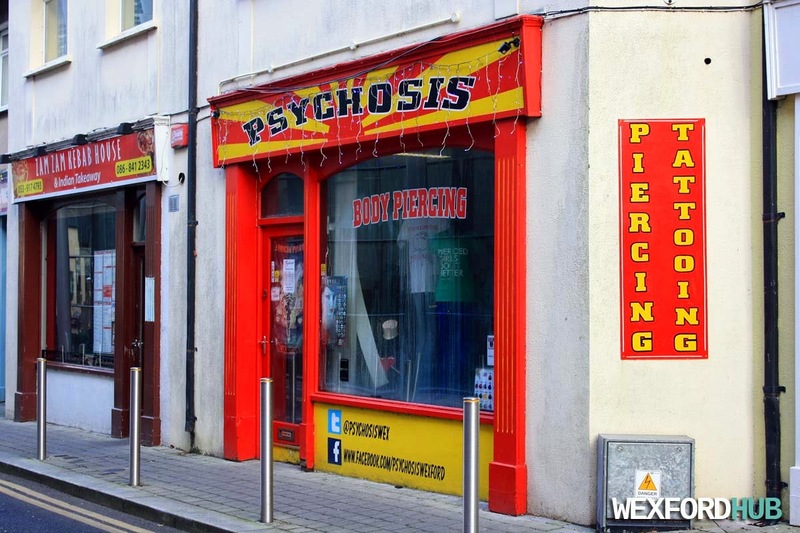 Psychosis is a tattoo and piercing store that also sells clothing items. Update: In December of 2015, the owner announced that it would be re-opening under a new name: "Be Pierced". 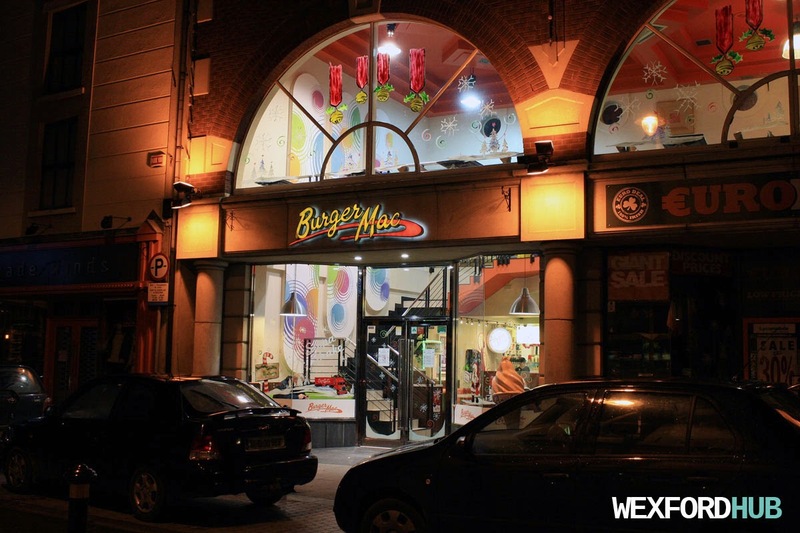 A photograph of Burger Mac, which is a fast food restaurant that is located on Wexford Town's Selskar Street. This was taken at night on the 26th December, 2014 (hence the Christmas decorations). Burger Mac sells a number of different foods, such as chicken burgers, taco chips, etc. 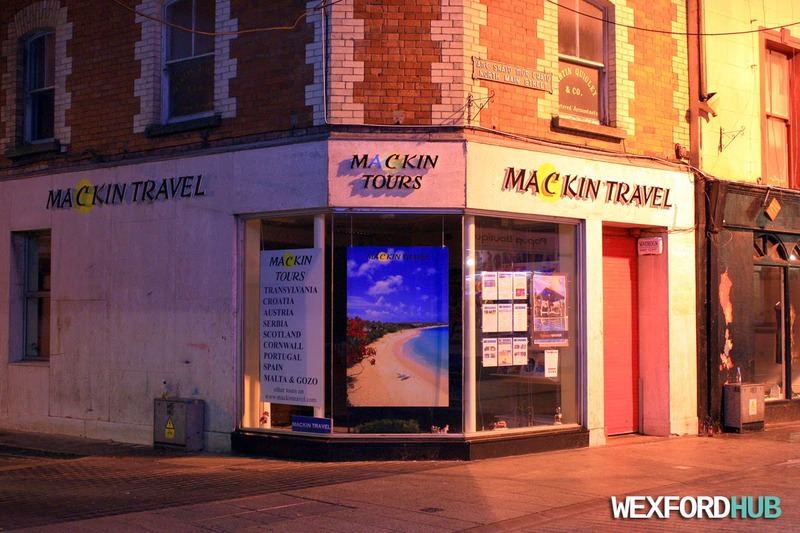 A photograph of the new Mackin Travel premises on Wexford Town's North Main Street (on the corner with Monck Street). In the recent past, this building used to house the Adult Guidance Service. 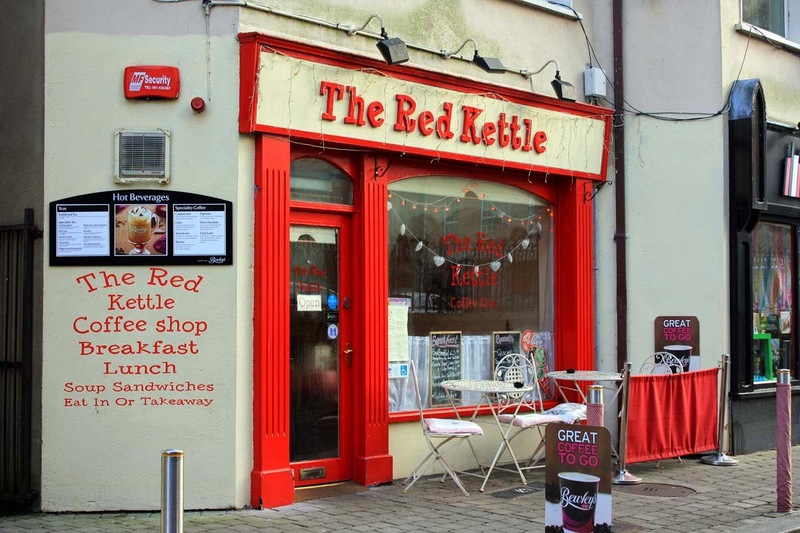 A photograph of the Red Kettle cafe on Wexford Town's Mallin Street. This extremely popular coffee shop serves breakfast, soup and sandwiches. 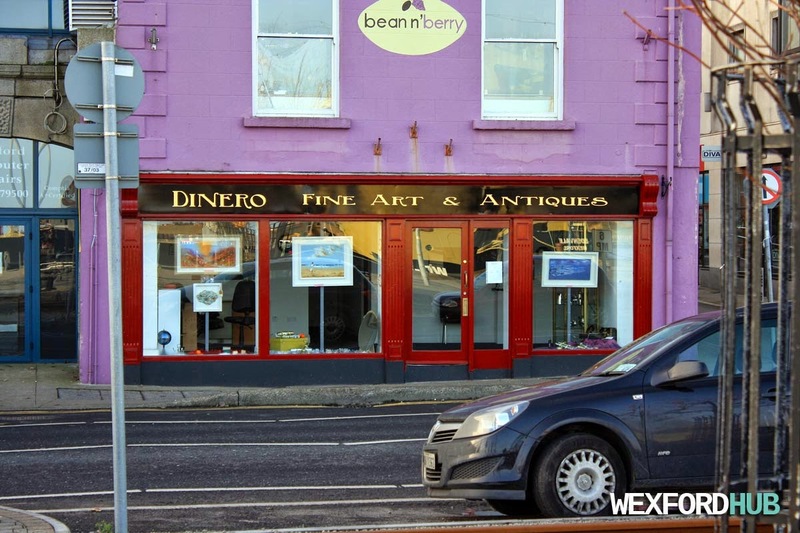 A photograph of the Dinero Fine Art & Antique premises on Wexford Quay. Taken in December of 2014. In the past, this premises was occupied by a PC accessories store called Smart Cartridge. 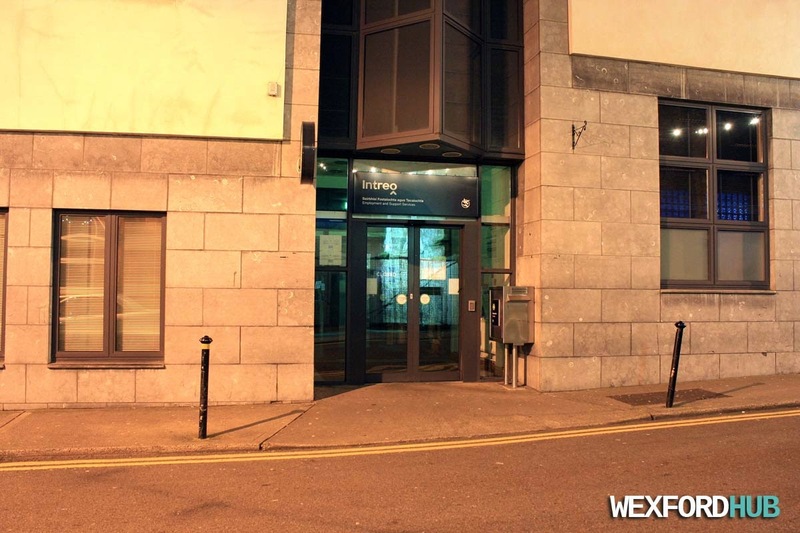 A photograph of the Social Welfare Office on Wexford Town's Anne Street. Officially, it is called the "Intreo Centre". A photograph of the premises in Selskar that used to house George Bridges' toy store and Christmas shop. Sadly, George passed away in December of 2014 after a fatal car collision. He was 93 years of age. Nowadays, this empty store is often used to display advertisements (the advertisement in the window is for a local pub called Mooney's). 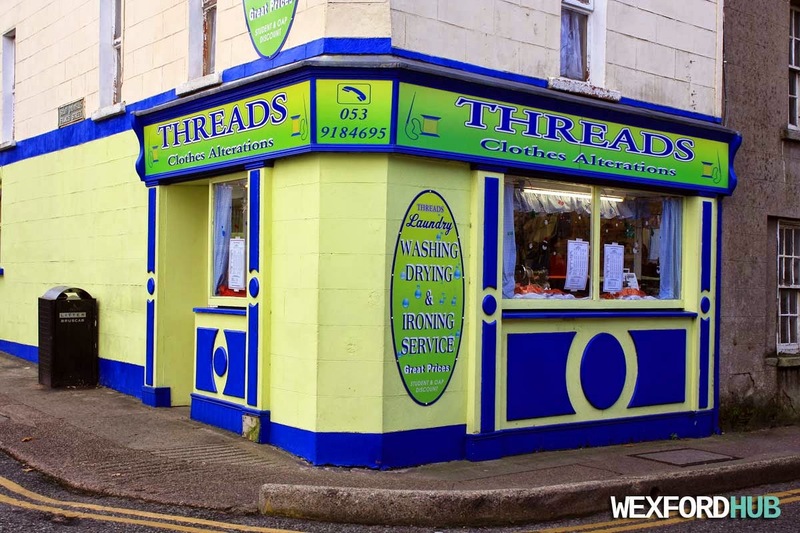 A photograph of the Threads Clothes Alterations shop in Wexford Town. Situated on the corner between Lower John Street and Francis Street. In the past, this premises was home to a newsagents. Update 2016: Threads Clothes Alterations has moved to Anne Street. 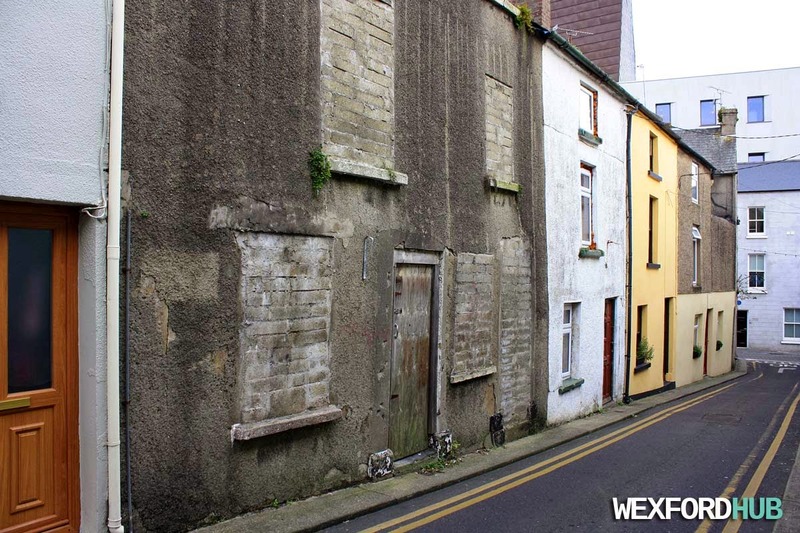 A photograph of the North Slob area of County Wexford. In the far distance, you can see Raven Wood, which is a forest in Curracloe. On the right, you can see Wexford Harbour. The North Slob is piece of reclaimed land that lies to the north of the harbour. It is 1,000 hectares in size and it consists of mud flats. Fun fact: One third of the world's population of White-Fronted geese use this area as their home during the winter. 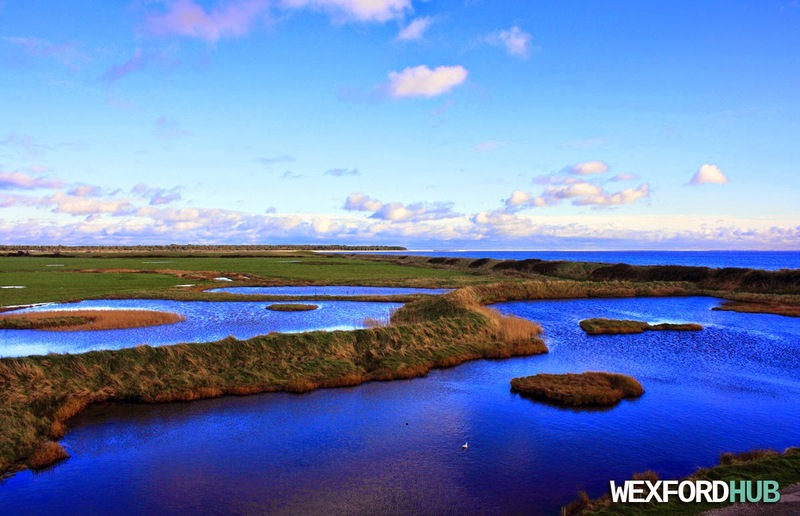 This photo was taken from the tower at the Wexford Wildfowl Reserve on the 8th of November, 2014. 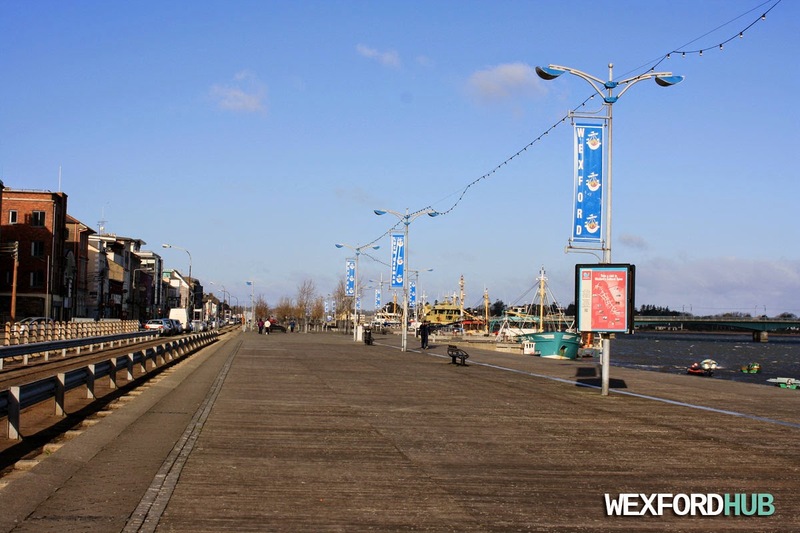 A photograph of Wexford Quay. 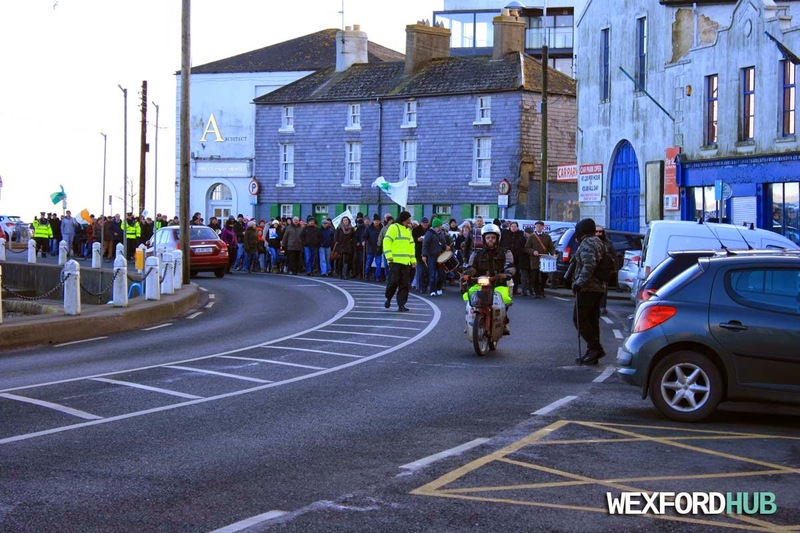 This shot was taken from the rail bridge that crosses the Crescent Quay. Taken on a weekday morning on the 9th of October, 2014. 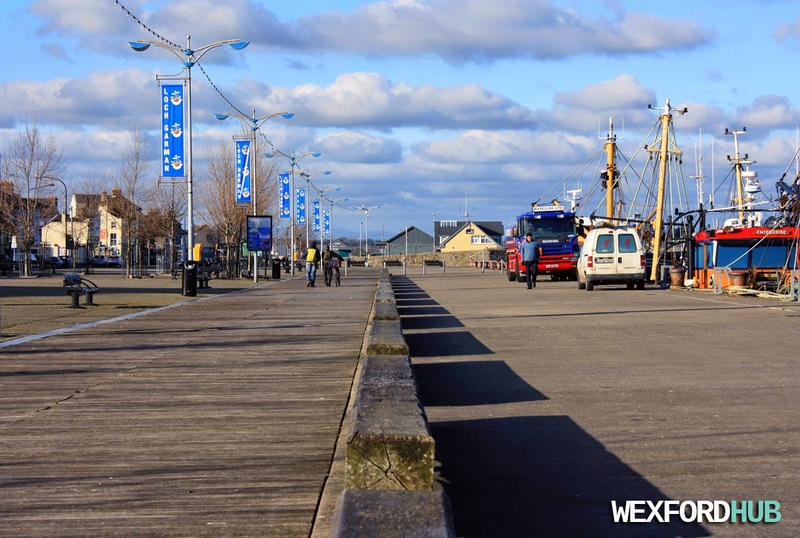 A shot of the wooden boardwalk on the quay front. This was taken in January of 2015, on an extremely cold and windy day! 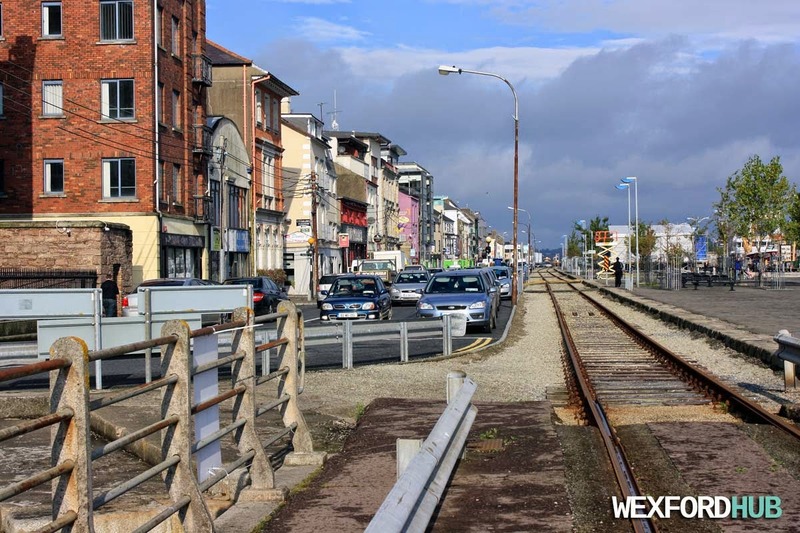 This one was taken up further towards Wexford Bridge, where a number of wooden block benches at lined up. As you can see, this is a popular place for people to take a stroll. The boats on the right are mussel dredgers. Photo date: 6th of February, 2015. 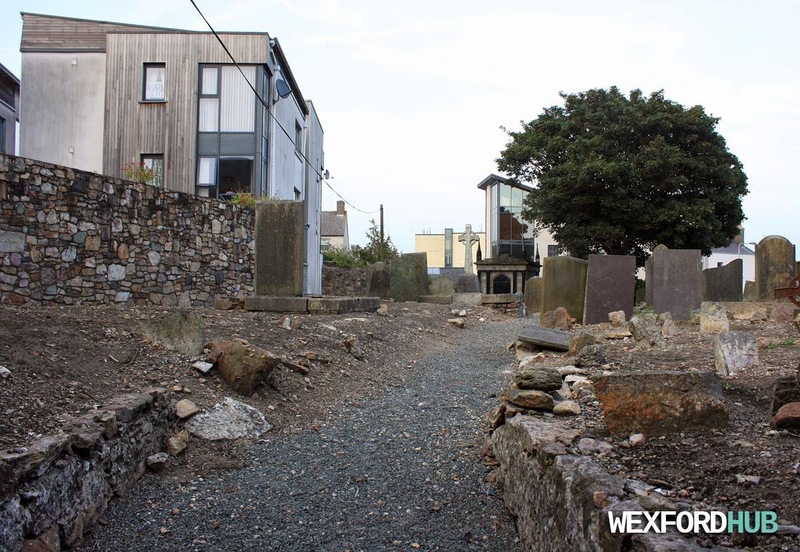 A photograph of the John Street graveyard in Wexford Town. This is the location of Home Rule MP John Redmond's mausoleum. 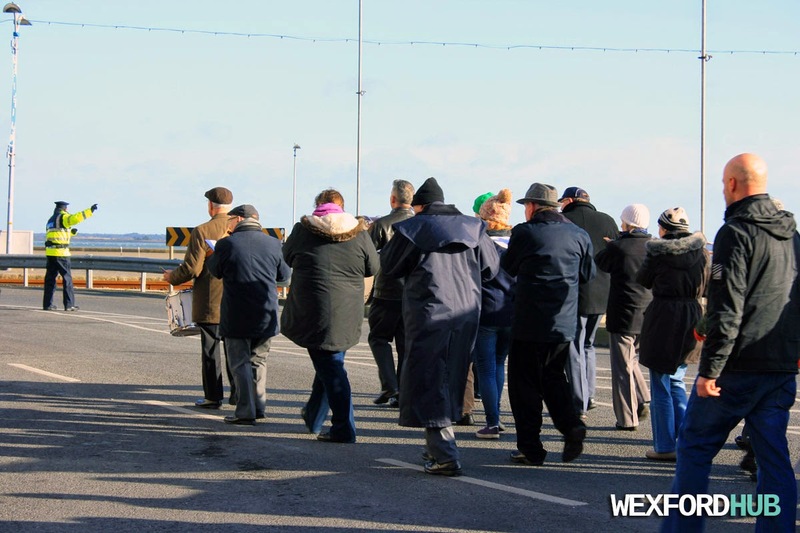 Although the graveyard is currently closed, the Wexford County Council does have plans to open it to the public in 2015. This picture was taken on the 12th of September, 2014. 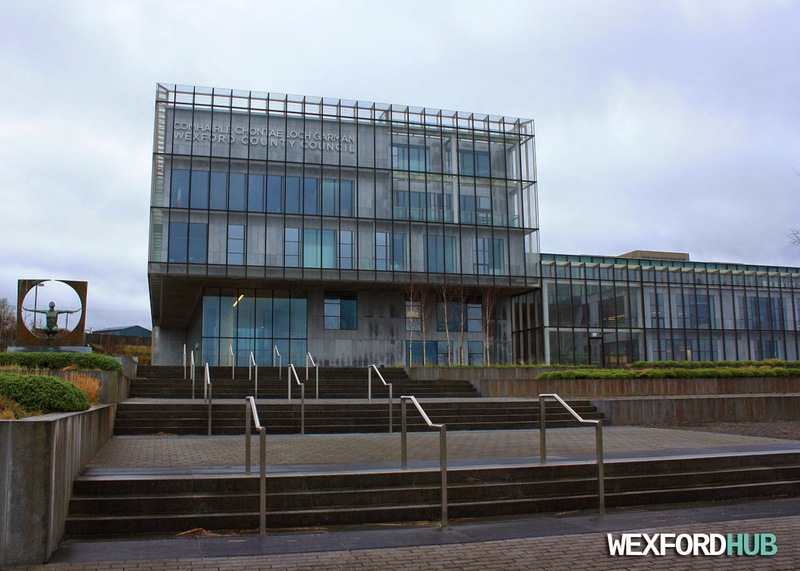 A photograph of the new Wexford County Council building in Wexford Town. 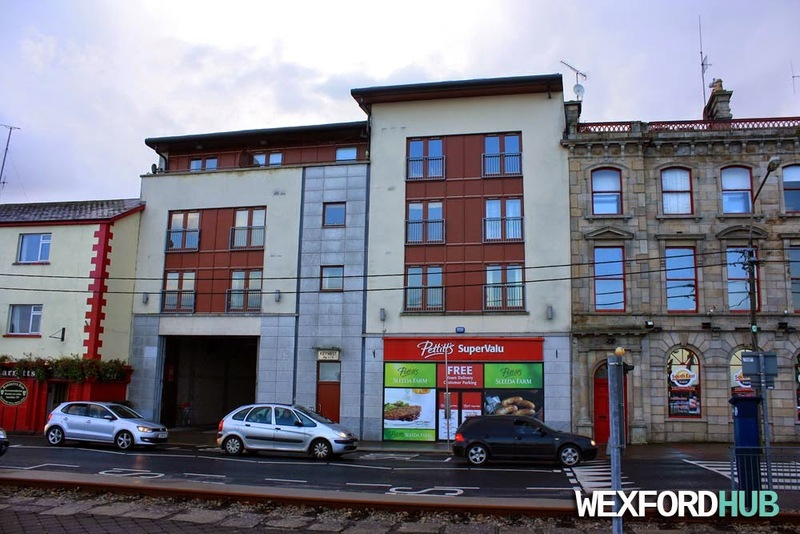 Located close to Wexford General Hospital in Carricklawn. According to the Independent, it cost €60 million to build! The design was done by Robin Lee Architecture. The statue on the left is called Solstice. 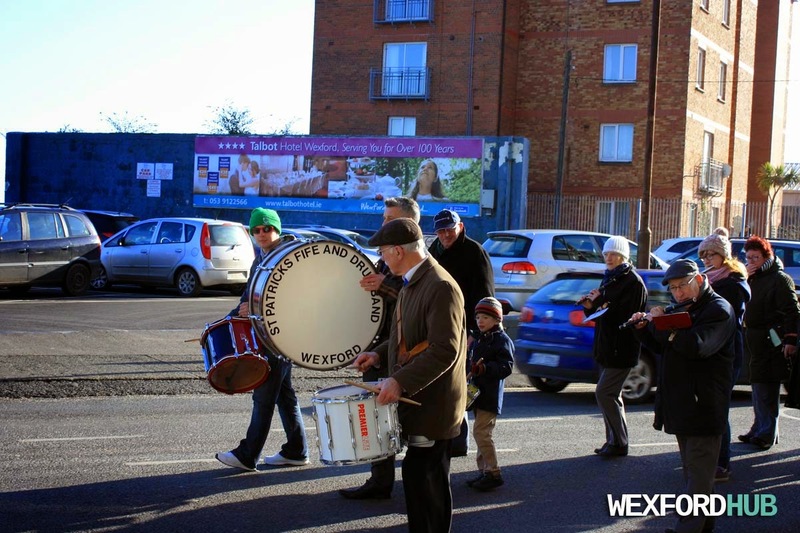 Photo taken on St. Stephen's Day in 2014. 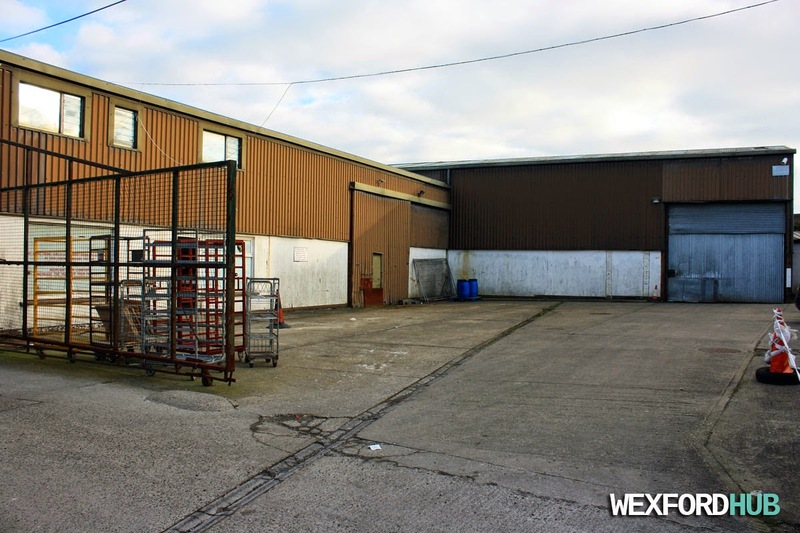 A photograph of the old 12,000 square foot premises in Kaats Lane in Westgate, which used to be home to Wexford Glass. The company had been situated in this area for 70+ years. In the early 2000s, Dunnes Stores purchased the land, leading to reports that the supermarket chain was going to add an extension. 15 years later and that still hasn't come to fruition. 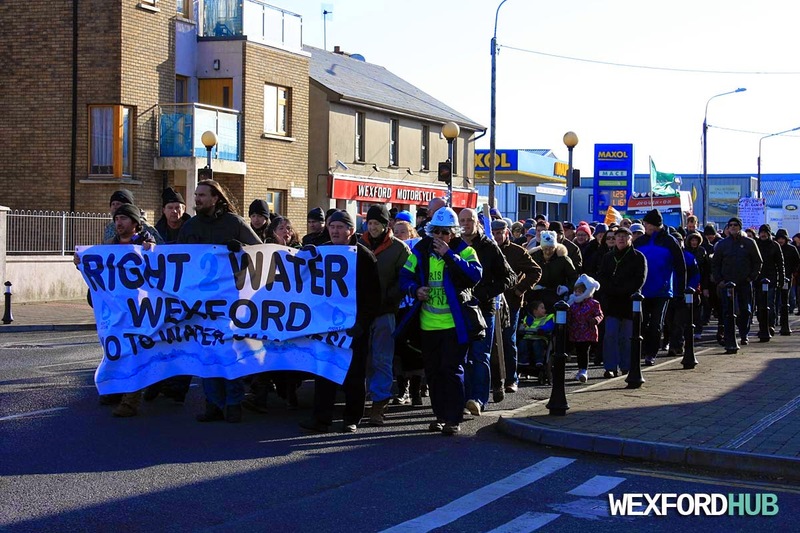 Nowadays, "Wexford Viking Glass" is situated in the Whitemill Industrial Estate. 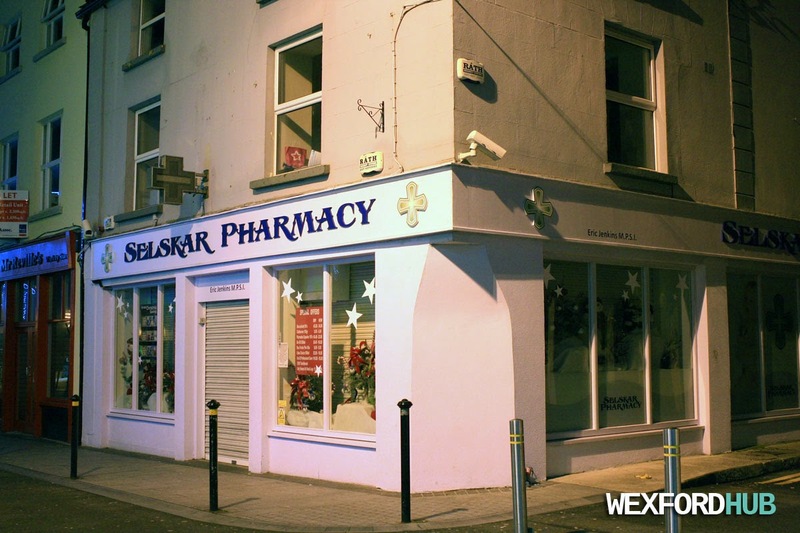 A photograph of the Selskar Pharmacy, which is located on Selskar Street in Wexford Town, on the corner with Skeffington Street. Before this pharmacy was opened, the premises was home to The Clearance Store. In the past, it was home to The Selskar Lounge Bar. 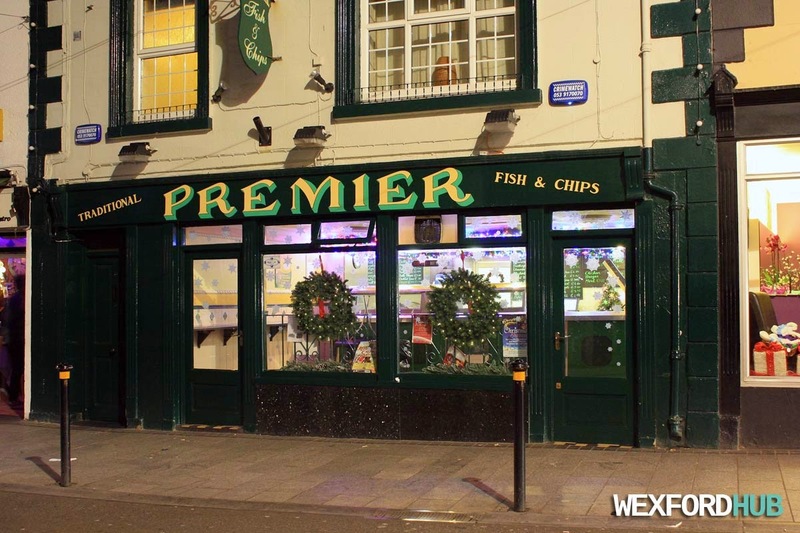 A photograph of The Premier, which is located on Wexford Town's South Main Street. The Premier is probably the most famous / well-known chip shop in the town. Head in here if you're looking for some fish and chips (or a battered rissole!) This was taken during the holiday season in 2014. A photograph of the Friary Church on Wexford Town's Lower John Street. 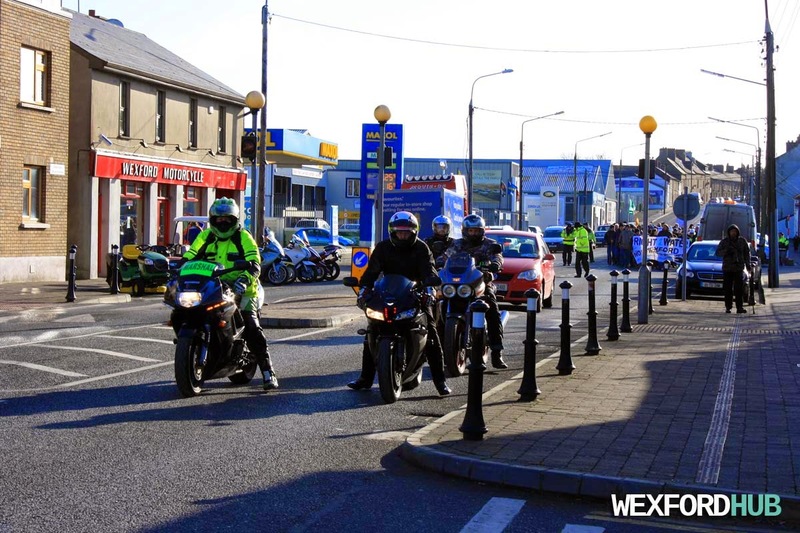 The Franciscan Friars arrived in Wexford back in the 1200s, while St. Francis of Assisi. was alive. This was taken on the 6th of December, 2014.